Once Christmas has passed I'll get back to posting some regular New England photography, but for now I'm having fun doing something a little different for a change. The snow has gently falling here along the coast of New Hampshire and we currently have about 3" in our yard. Not much. It's cold so the snow it dry and fluffy. I always have such a soft spot for the birds on a day like today. The peanut, sunflower seed, thistle, and suet feeders are all full yet there are some birds who won't eat from them, so I put seed on the ground. Hopefully enough to satisfy all who come looking for a meal to stay warm. Shopping at the mall last night I happened to notice B. Dalton was going out of business so everything is 40% off. Browsing around the store there was still a fairly decent selection but the closer it gets to Christmas the cheaper I get so all I bought was this magazine. I know Christmas is almost here but if you love beautiful things, and happen to see the magazine, buy it. 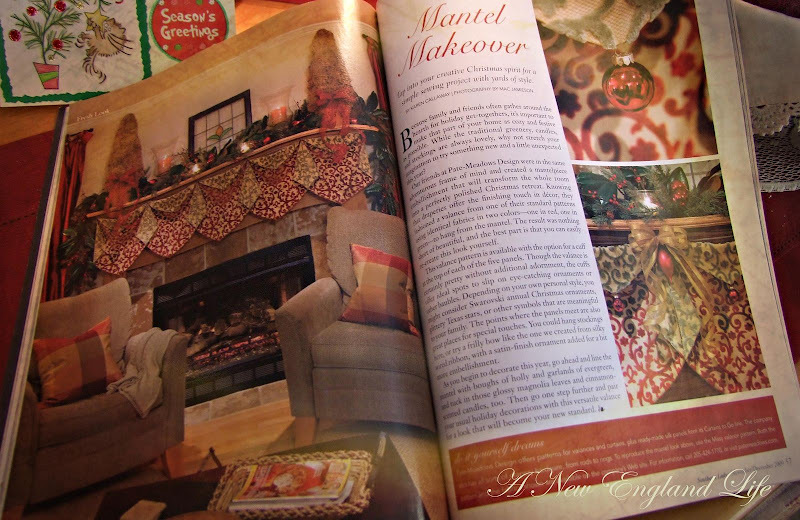 Page after page of wonderful holiday decor and cooking! Below are a couple photos of my Christmas tree. Not the whole thing mind you as there really isn't much towards the bottom. Phineas finds ornaments very enticing and a great source of joy, so it is what it is. Usually the girls complain every year about the tree. This year they both seem happy with the Victorian feel. Me too. Next up ... The results of my Poinsettia Topiary and Luna! Yes, I know it's very exciting, but surely you can hang in there. Ha haa! What a beautiful tree! 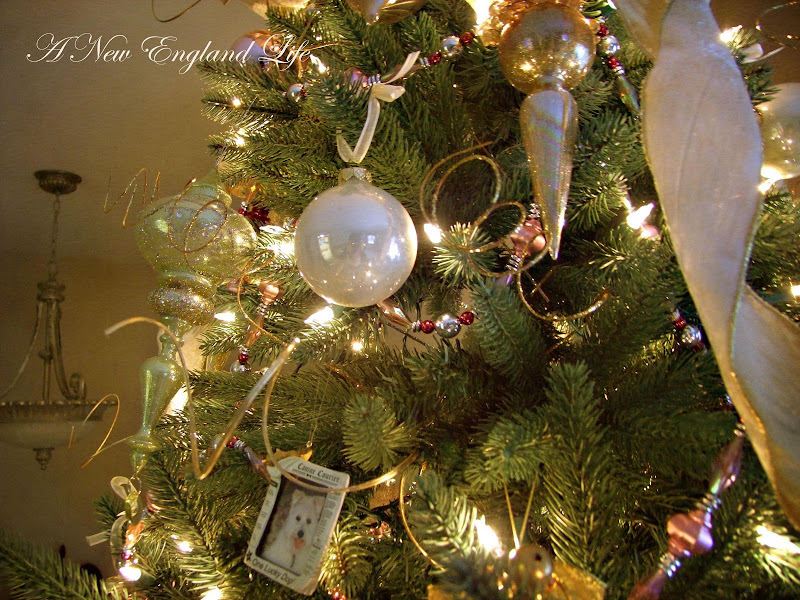 Love the ornament with your sweet dog's picture. 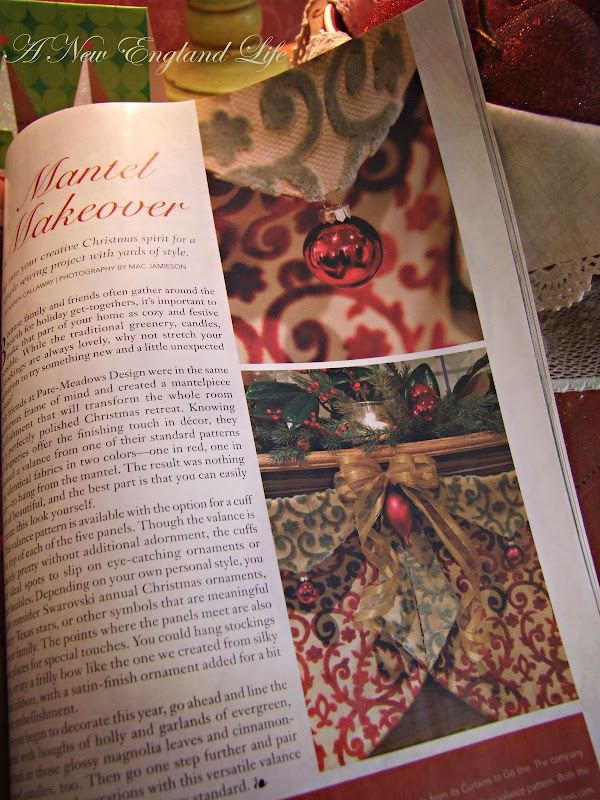 Many of the ideas in the magazine can be worked into year round decor. Don't know if B. Dalton is still in business at a mall here - have not been in a long time. I love that 3 inches isn't much there. Three inches in western Kentucky has everyone around here driving into ditches and acting like Chicken Little. You're tree is divine. So sparkly and pretty. oooooooooh.i need to look for this mag. i am such a mags addict....lol. did you say poinsettia topiary?.....hmmmmmm. Lovely tree! All light and airy and real to boot? Glenda, you noticed Lily! I wondered if anyone would. And you're right, much of what's in the magazine can be used every day. There is a LOT more than what I've shown here! Thank you Susan, I appreciate you stopping by! Hula Girl, 3" of snow is nothing here in New England. Just get in that 4WD, or AWD in my case, and get out there and GO! Hi DJ! Yes, you'll love the magazine. I'm holding onto it for ideas for next year. Hello Lucy, nope it's fake. Pretty though, huh? Except never buy a prelit tree. Half the lights have already quit after only 3 years. Love the new banner. Your tree is gorgeous, I adore anything Victorian. I might just have to pick up that magazine, it looks wonderful. The snow was so beautiful today but since it was my day to go to the nursing home I didn't get to take photos. Oh well I'm sure I'll get another chance. How pretty everything is. Enjoy your snow! I think your tree is quite lovely. THat is a beautiful decorated Christmastree, a real one as I can see. I love that victorian look. 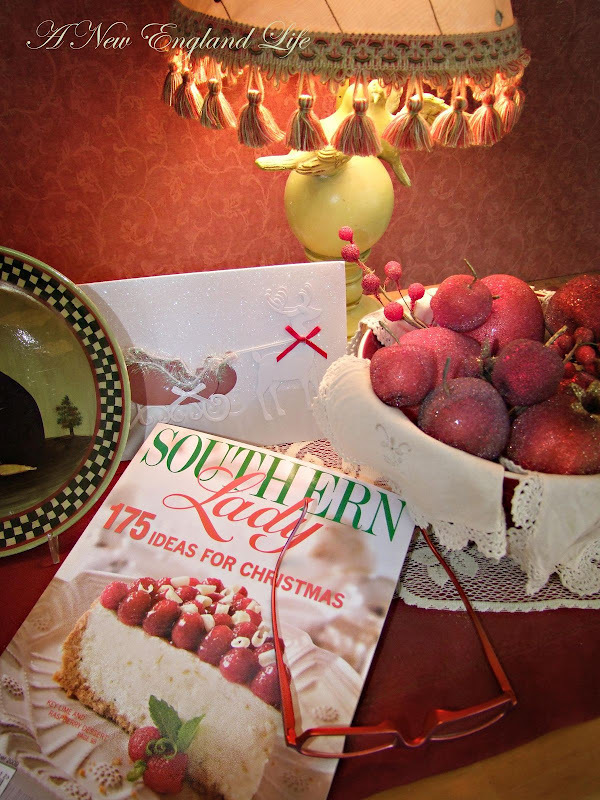 I will have to look for Southern Lady, Sharon, now that I am one!!! Your tree is lovely! No complaints is wonderful! Looking forward to the next post. Great post and a beautiful tree. Merry Christmas Sharon. Well, the furfaces are a big part of our lives, and it is easier to adapt the tree to them, than to keep yelling at them when they do not understand the ornaments are not for them! Your tree is so pretty, Sharon! We didn't attempt one this year - I do miss it, but then again, getting it all set up and taken down is something I don't miss! I hope you and your family have a wonderful Christmas! 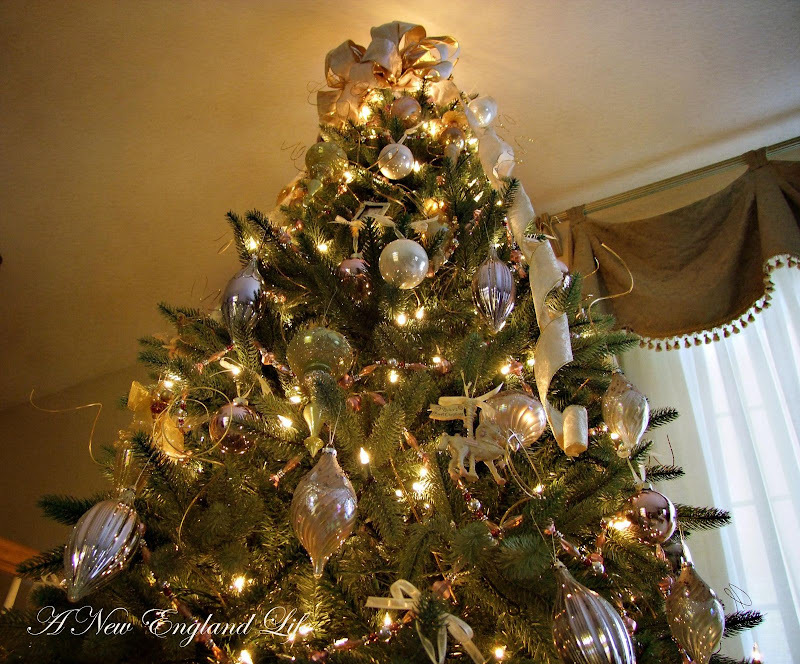 A Beautiful Victorian Christams Tree! Many years I've had a tree that was only decorated 3/4 of the way w/ no ornamanets near the bottom, toddlers and pets are the culprit! Gorgeous tree! I love anything the color of chocolate. 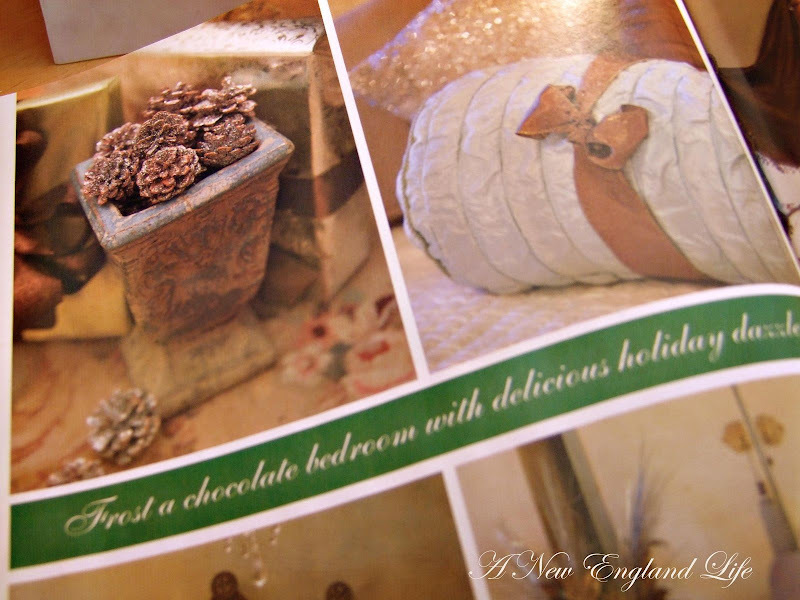 I'm searching for the perfect comforter of chocolate and blue. MErry Christmas! I just wanted to tell you that I just love your pictures. I hope you and your family have a Happy Holiday. 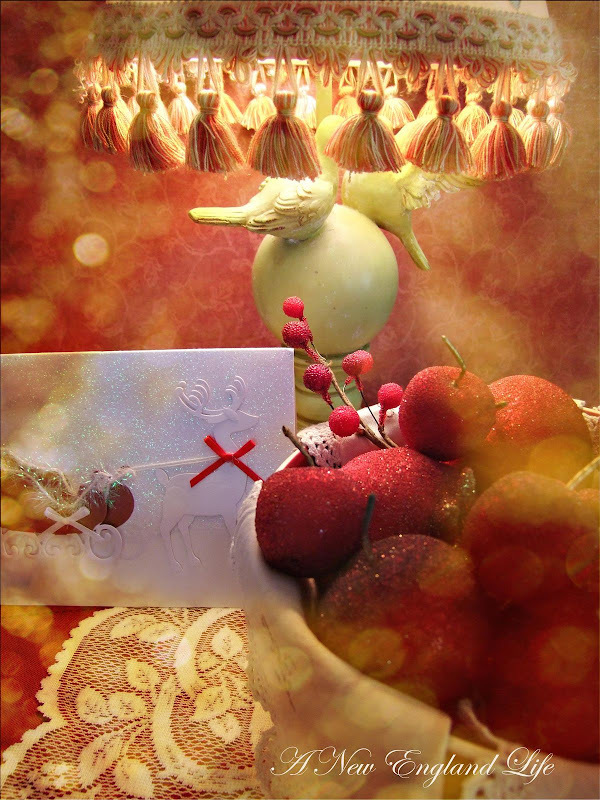 May you and your family have a very Merry Christmas and a happy and healthy New Year 2010!! Lovely tree! Thanks for sharing. I also love the pics of your furbabies. My Nannie Nutmeg has a collar similar to your Lily's, although I didn't make it. I have a Lily Belle (lab rescue), Nannie Nutmeg (yorkie stray), Tammy Tabby (abandoned gray tabby) and Scamp (yellow tabby stray). There is a special place in my heart for others who are kind to animals. Gorgeous tree...I love the look. Your tree is gorgeous! Wow. And the magazine is too cha cha for words. I like the special effects on the photo. Your tree is beautiful. You have very exquisite ornaments.